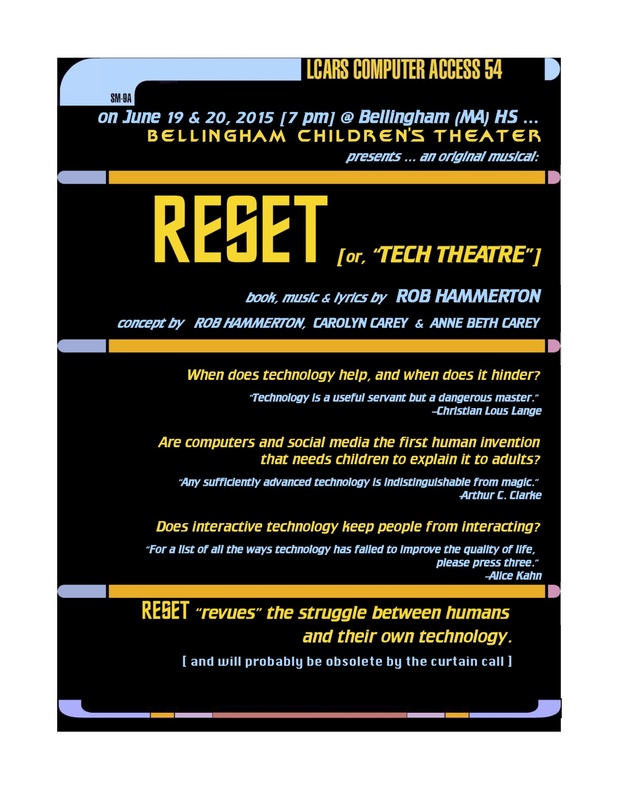 Thanks to a series of interesting brainstorms involving the founders of Bellingham Children’s Theater (of Massachusetts — there’s another one, out in the Pacific Northwest, but this is THIS one, not THAT one!). BCT is an outfit for whom I have had the pleasure of musically-accompanying since 1999, … hey kids, let’s put on a show! This one happens to be the 35th year that that BCT has produced a musical in late spring. An organization like this doesn’t just magically achieve such longevity without having some clue as to how to do it right – and do they ever have said clue. The end result of those curious brainstorms is a cautionary-tale of a musical that tries to address these Crucial Issues Of Our Time: When does technology help, and when does it hinder? … Are computers and social media the first human invention that needs children to explain it to adults? … and … Does interactive technology keep people from interacting? Stylistically, the best way I can describe this show is: “A Very Special Episode of Rowan and Martin’s Laugh-In”. It’s called “Reset”. Unofficially, I have offered the alternate title of “Tech Theatre”, which is a joke aimed at a smaller subset of humanity; but either way, by the end of the thing, the very present question is: in the struggle between us puny humans and our mighty technology, who’s going to prevail? And as with a lot of technology, by the end of the thing it’s going to be obsolete. I think I’m only half-joking. In the time since it was written, we’ve seen and then discarded at least half a dozen Important Memes Of Our Time, including the “Crying Piccolo Player” and the Apple Watch. And it’s curtain-up in two weeks! Or less, depending on when you’re reading this. And I’d love for you to come to our air-conditioned theater (a very helpful technology in New England’s version of June) and have a laugh or two, and admire the cast of about fifteen talented children and their instructors – who, after producing my previous two musicals, somehow still wanted me to help create a third one! How to get there: From the Mass. Pike: Take Rt. 495 south … take Exit 17 (“Rt 140 – Franklin/Bellingham”) … follow Rt 140 North for ~2 miles … Blackstone St. is the 2nd set of lights inside Bellingham, just past the “Cottman Transmission” sign (…if you get to the intersection of Rts. 140 & 126, you’ve overshot) … Bellingham HS is on your left (after the Fire Dept. and Senior Center). Or, fittingly, program your car’s GPS device. See? It takes work to keep up! !